Christopher Columbus's second expedition has been often referred to as “Hell on Hispaniola.” Columbus was anxious to prove to the Crown the value of his New World discovery. He demanded that the natives bring him a daily tribute of gold. When the gold ran out and the indigenous people revolted he sent them to Spain and had them sold as slaves. Then, a short time later, when the first settlers revolted over the conditions in Hispaniola, Columbus had the local natives enslaved and used for forced labor. This system would eventually evolve into what the Spanish called the encomienda. The encomienda was a medieval practice that originated during the Spanish wars against the Moors. Lands and people (forced laborers) were assigned to a military leader or colonist. It was the colonists job to protect the natives. They were also required hire a parish priest, and convert the natives to Christianity. Unfortunately, many of the people who were awarded encomiendas treated their slaves deplorably. In some cases, slaves were worth so little that is was easier to replace them than it was to feed, clothe, and house them. Piles of human bones became a common sight near the entrances of mines and other forced labor sites. In less than twenty years the population of Hispaniola dwindled from several million to 29,000. None of this enormous population loss can be attributed to European diseases as they did not strike until 1518. The first people to protest against the way the Native Americans were being treated were the Dominican friars who began arriving in Hispanola in 1511. King Ferdinand responded by passing the Laws of Burgos which approved a code of conduct for Spanish-Indian relations. It was largely ignored. After this failed a jurist named Dr. Juan de Palacios Rubios crafted a document which was to be read to the Native Americans before killing or enslaving them. It was called the “Requirement or Requerimiento,” and it called on the Native Americans to recognize the supremacy of the church, the pope, and the Spanish monarchs over their lands. If the native rejected these demands he could immediately be killed or enslaved. Most of the conquistadors treated the document as a joke, sometimes reading it after the natives had been enslaved. It didn't matter that the people didn't understand what they were saying. Batholome de Las Casas, the first priest ordained in the New World, fought world wide for Native American rights. 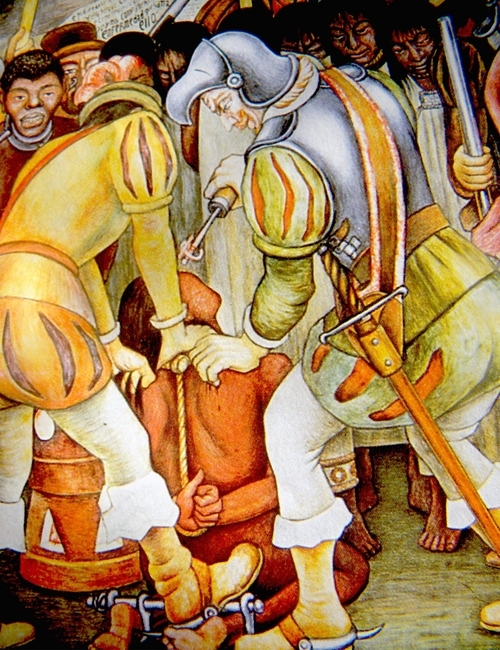 He believed that as many as twenty million people had been murdered or enslaved by the Spanish Conquistadors. This is a number so large that it is disputed by many historians. However, the number is clearly in the millions. Eventually, Las Casas would earn the ear of King Charles. King Charles, appalled by what he had heard about the abuses, sent an order to Hernan Cortes telling him to abolish the encomienda system. However, Cortes and his friends all had enormous encomiendas and they refused the order. Cortes argued that the encomienda system was important for the security and the welfare of the new colony. In fact, it would remain the main source of income for the colonist until 1560. In time, the supply of Native American slaves would become exhausted and slavers would again turn their focus on Africa. By 1600, over 75,000 African slaves were living in the Spanish colonies.